This is going to be hard. I’m trying my best to accommodate the Williams era, often having an internal argument over the way the producer was shaping the show, within the budgetary constraints at the time and the results he produced. So far, it’s been very up and down in terms of quality. With Underworld we reach perhaps one of the lowest ebbs of the Williams era. No, I’m not going to have a go at the CSO. It’s clearly a design decision forced by the production having gone over budget. Sometimes, you sneakily admit that it comes off in some scenes, just about, but on most occasions it really does look so wrong. 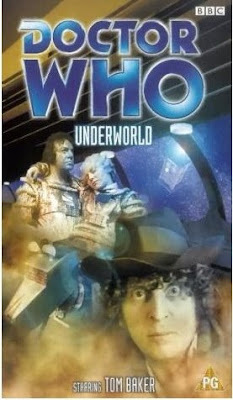 However, the series itself has always been littered with CSO nightmares and the Letts/Pertwee era is equally at fault. It gets away with it because Letts always argues that they were very much experimenting with a new technique. With Williams, it’s a budgetary decision purely and simply. And the received wisdom that watching it in black and white makes an improvement is rubbish and is a very feeble argument for the lacklustre nature of the story. And somewhere in the middle of this, there is a non too subtle attempt to jump on the then in vogue bandwagon of Joseph Campbell’s analysis of myths and archetypes. 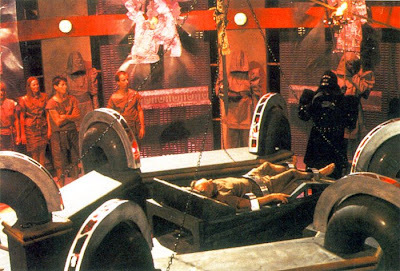 Star Wars ransacked that particular cupboard in 1977 and Underworld plays with a few of the scraps and throws in Time Lords as the ancient Gods to the Greeks of Jackson and Co of the R1C. Greek myth is an important storytelling element in the classic series and in the new but here it’s simply window-dressing for a dull plot about a maniac computer called the Oracle. We’ll get a similar reworking of Greek myth in The Horns Of Nimon and arguably that’s a far more interesting and entertaining story for all the wrong reasons. It’s a shame, as the first episode is actually very good. The design of the R1C is excellent (it probably blew the design budget which resorted to the production using CSO for the rest of the episodes, I suspect) and Richard Conway’s visual effects are really very impressive, the model work almost as good as that seen on big budget productions like 'Space:1999'. The costumes and props for the crew of the R1C are pretty good, especially the shield gun design, and there’s visual excitement that matches the pace of that first episode. But then we get to episode two and in the lair of the Oracle. It’s all so brown and dull just like the rags that the Trogs are wearing. I quite like the black outfits and the hoods of the slaves of the Oracle but without a good actor, used to working through masks, the threat posed by these villains is negligible. 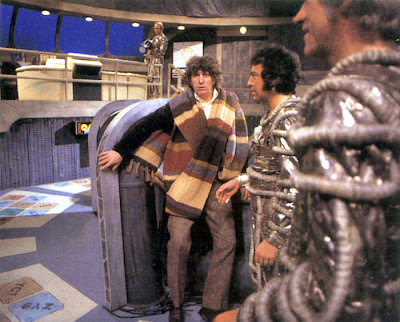 In fact, the threat from the Oracle and its slaves is so underwhelming that even the Doctor sounds rather tired when he realises he’s up against a raging machine and points the cliché out before the audience does. And that lack of threat is what is wrong here. The series needs credible, motivated and scary villains/monsters even if they’re played so over the top they become pantomimic (which they do during the Williams era, to a degree, when they do appear). Here we have hooded thugs with no charisma and a ranting computer that resembles a bad lightshow in the Top Of The Pops studio. Its other problem is that it postulates rather a lot of bad science, a Bob Baker and Dave Martin trademark, especially about the formation of planets, the nature of gravity and mass and that old bugbear, radiation. I’m not a fan of hard science fiction but where the series dips into that area I would hope that at least some of the science is basically right. The regulars acquit themselves well, Baker’s a bit on remote control (i.e. wind him up and point him in the right direction and he’ll do OK) but Jameson holds this together with a good performance, one of very few that make an impression here, with the other being Alan Lake as Herrick. The rest of the cast are fairly unforgettable which demonstrates how bland this is. The naturalism of the previous years is gone and the satirical whimsy that replaces it does sometimes work in the hands of good writers and directors – The Sunmakers being a good example – but here it’s just a bit of food colouring to try and make a rather uninspiring cake a bit more interesting. Oh, dear. No matter how you look at it, even if it was made with the swankiest visual effects, Underworld remains a dull runaround in CSO caves and that’s a story problem not a production problem. It's also what inspires a horribly inaccurate view of the series - all running around in caves with bad costumes and acting - that comes back to haunt the series again and again. That probably sums this story up as perfectly as it's ever gonna get! I watched K9 & COMPANY again recently and was tempted to write a review of it. But just how does one describe the opening titles...? Oh, Cameron, wait until you read the K9 & COMPANY review I've got lined up. Yes, THAT title sequence. I believe using it on a loop is now favoured by CIA interrogators in Guantanamo Bay. Those evil terrorists buckle under repeated viewings of Sarah-Jane's jogging fashions. Thanks for popping by, again.